“Tabloid journalism” was US Chess Captain John Donaldson’s verdict on the recent story in the New York Times on attempts to recruit Fabiano Caruana by the US Chess Federation. He also told chess24 why Hikaru Nakamura and Gata Kamsky will miss the World Team Championship and that Wesley So has his full support to play in the Shamkir Chess tournament instead. 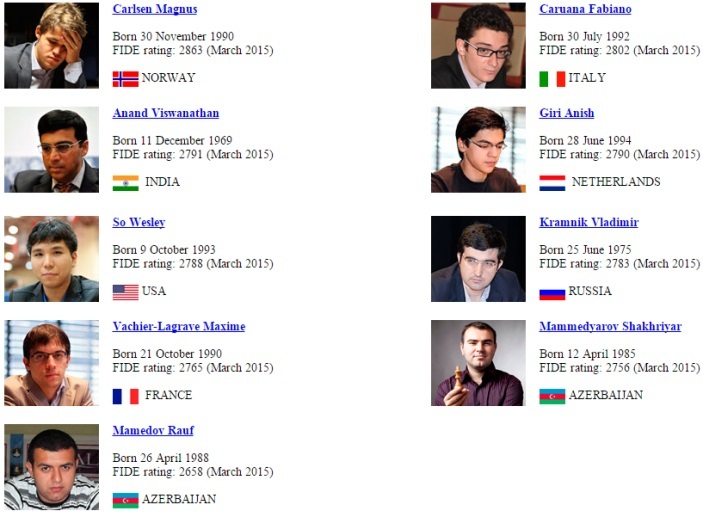 That event features Magnus Carlsen, but not Teimour Radjabov, who had to withdraw for personal reasons. UPDATE: Azerbaijan website ExtraTime say English Grandmaster Michael Adams, currently rated 2746 and world no. 16, will be Radjabov's replacement. It’s all about to kick off! 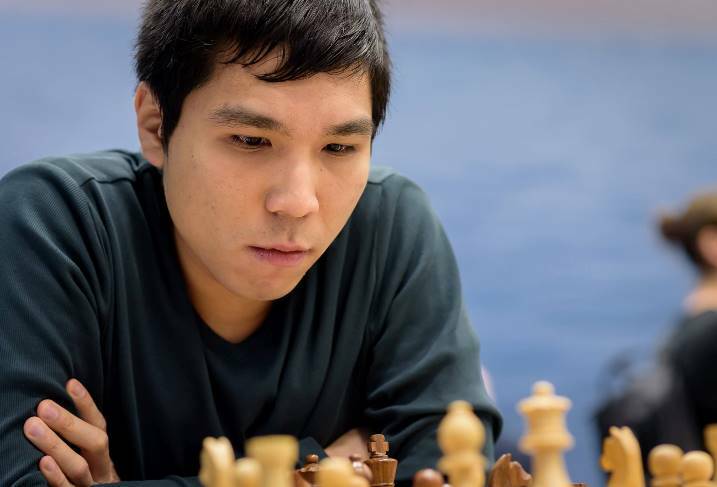 On Wednesday we have the first games of the US Championship, featuring Hikaru Nakamura, Gata Kamsky and, for the first time since he changed federation, Wesley So. 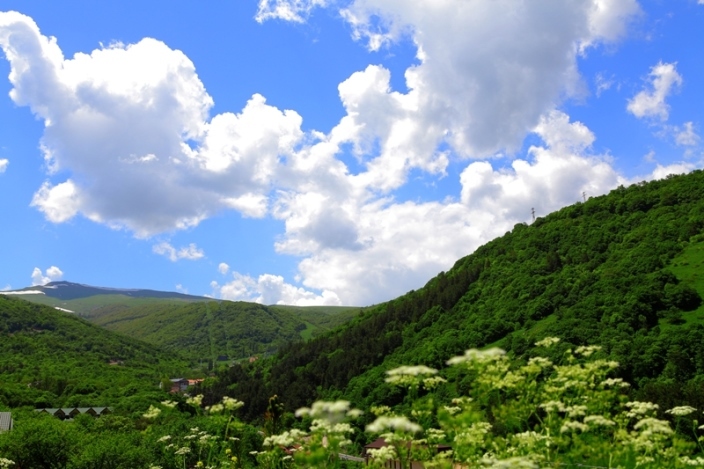 That 11-round event in St. Louis — which will of course be broadcast live here on chess24 with English and also Spanish commentary — will quickly be followed by two competing events in Azerbaijan and neighbouring Armenia. 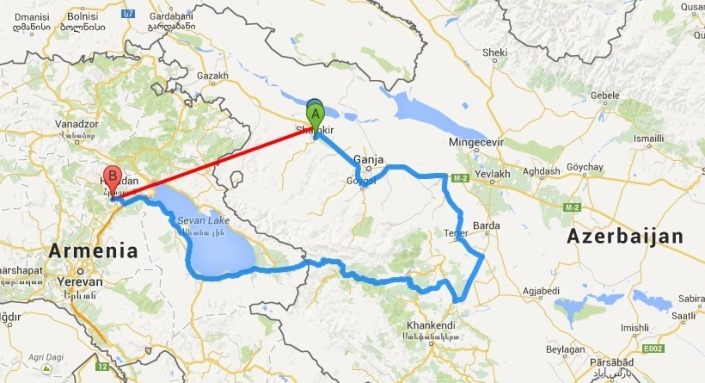 On a map you can see that Shamkir, Azerbaijan, the venue of the Shamkir Chess tournament (April 17-26), is just 70 miles from Tsaghkadzor, a spa town in the Armenian mountains that will host the 10-team World Team Championship (April 19-28). The tournament in Shamkir is held in memory of Vugar Gashimov, the hugely talented Azerbaijan player who died last year at the age of only 27. 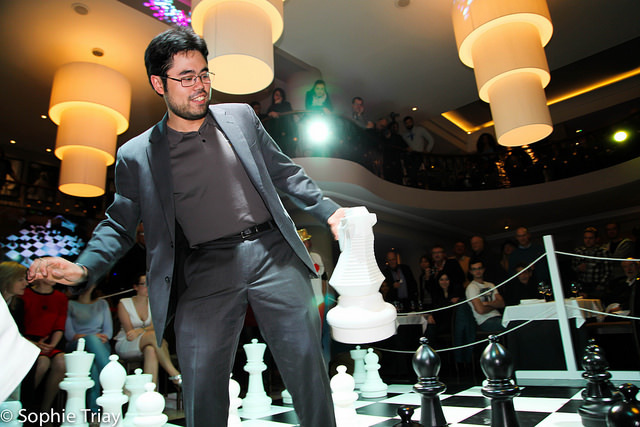 The first edition of Shamkir Chess was a great success, featuring a spectacular venue and top notch video coverage. World Champion Magnus Carlsen added to the excitement by suffering a mid-tournament wobble — losing to Teimour Radjabov and Fabiano Caruana — before storming back to win the event with a last round victory over Caruana. This year the 6-player double round-robin format (Carlsen, Caruana, Nakamura, Radjabov, Karjakin and Mamedyarov took part in 2014) is being replaced by a 10-player single round-robin, with the addition of both the experience of former World Champions Vladimir Kramnik and Vishy Anand and the youthful energy of Wesley So, Maxime Vachier-Lagrave and Anish Giri. One thing you’ll note, though, is that there are only nine players. Teimour Radjabov has recently had to withdraw for personal reasons, with a replacement set to be announced imminently according to a source familiar with the organisation, speaking on background (as mentioned above, the replacement will be England's Michael Adams). Radjabov also confirmed his withdrawal via email. Former World Champion Veselin Topalov had dropped out earlier after initially agreeing to play, with 2015 Azerbaijan Champion Rauf Mamedov replacing him. The World Team Championship, meanwhile, is a prestigious biannual team tournament that is often considered tougher to win and less subject to chance than the Olympiad, since the round-robin format means there’s no chance of sneaking onto the podium by dodging the big teams. Russia enter as defending champions and favourites, with Grischuk, Karjakin, Tomashevsky and Jakovenko set to play. It’s notable that Kramnik, who led the team (to ignominious mediocrity) at the Olympiad, will be in Shamkir instead, while Karjakin, who drew all his games in Shamkir in 2014, will play the team event. Russia will face fierce competition from the likes of hosts Armenia (Aronian), Ukraine (Ivanchuk, Ponomariov, Eljanov), China (Ding Liren, Yu Yangyi, Wei Yi) and Hungary (Leko, Rapport, Almasi). Other teams include Olympiad bronze medallists India, Cuba and Egypt. Azerbaijan have surprisingly never won a World Team Championship medal, and that’s not going to change in 2015. They turned down the chance to play they’d earned by winning the 2013 European Championship and will be replaced by Israel. Their top players were of course expected to play in Shamkir, but it’s not clear if the clash of dates of the two tournaments was entirely coincidental. One team captain, at least, thinks it wasn’t — which brings us to the final participants, the United States. US issues: Nakamura, Kamsky, So... and Caruana? It was the sort of tabloid journalism one doesn't expect to see in the New York Times with speculation substituting for fact. He was keen to explain why the three highest rated US players will not be taking part. Gata repeatedly announced the past two years that when he turned 40 he would retire from the US team. He turned 40 in 2014 and Tromso was his last event. Wesley committed to playing in Shamkir without knowing the dates. He also planned to play in the World Team. The World Team dates were announced 9 months ago. The Azeris intentionally scheduled their event against the World Team putting Wesley in a difficult situation. Everyone on the US team supports his decision to play in Shamkir. This is a special opportunity to test himself against many of the best players in the world. Donaldson confirmed that Wesley had paid FIDE’s transfer fees himself to switch from the Philippines to the US (somewhere from 3,750-5,250 Euro), but that the Philippines hadn’t ultimately demanded the 50,000 compensation fee they could have requested. In that case Wesley would have waited for two years to pass before he could play without paying any compensation. The US team did not qualify for the World Team in Tromso (we lost to the Azeris in the last round but could have won if Hikaru drew and Alex won, which almost happened) and for a long time it appeared we would not be playing. The other event for qualification, the 2015 Pan American team championship, will not be held early enough to determine a qualifier. Thankfully FIDE President of the Americas Jorge Vega and US Zonal President Franc Guadalupe worked an arrangement whereby Cuba got the wildcard qualifier and the US the spot from the Americas. This was only known in February of this year — for the preceding half year it looked a very unlikely possibility. Hikaru figured late last year we were not going and made his plans then for 2015. They seem to be working out pretty well so far! 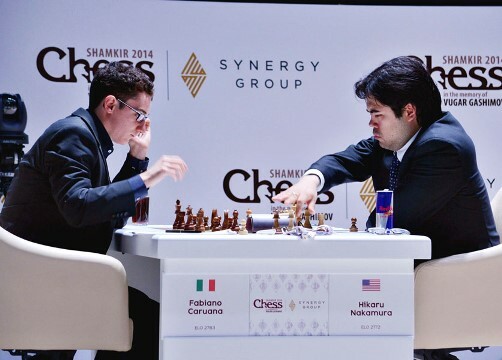 It’s still not clear whether Nakamura was invited back to Shamkir after playing in 2014 (he beat local hero Shakhriyar Mamedyarov twice but also lost twice to Magnus Carlsen) and, if he was, why he turned down the offer. Onischuk, Robson and Shankland are all rated within twenty points of Gata and the latter two are moving up fast. The US may end up seeded ninth out of ten teams in Armenia, but every player is over 2600. We have several rapidly improving players and good team chemistry. That leaves the issue of Caruana. Donaldson had never heard of the existence of a “Player Opportunity Committee,” as mentioned in the New York Times article, but emphasised that Caruana was a special case. He was born in the US and lived there until he was about 13. He represented the US in at least one World Youth Championship. He is a US passport holder. His primary (by far I'm told) language is English. When Fabiano became a teenager the US chess scene was much different. There was no Jeanne and Rex Sinquefield, the US didn't have two players in the top 10 and a half dozen in the top 85 players in the world. His father Lou had to make a tough choice and correctly (in my opinion) moved his family overseas to improve his son's opportunities for better coaching and tournament opportunities. One would like to think that if he had been born ten years later there would be enough chances in the US. The Italians have very generously supported Fabiano's chess career the past decade and he understandably feels loyal to them. That said, times change and he may decide to switch back to representing the United States in the future. The purpose of the Fund is not to actively recruit players from other federations, but rather to enable players committed to playing and promoting chess in the United States to more readily transfer between federations. The Fund will be overseen by a three-person committee, ostensibly independent of the USCF Executive Board: Anthony Saidy, an IM, author and former mentor of Bobby Fischer; Jim Berry, a former USCF President; and Sophia Rohde, National Tournament Director and International Arbiter. Individuals interested in supporting the Player Opportunity Fund may donate to the Fund but may not require that an individual recipient be funded as a condition of their donation. Donors will not be permitted to recover a donation on the grounds that the USCF did not honor their recommendation. It is one thing if a player comes seeking to transfer to the USA, it is quite different if we go out and attempt to attract the best players from other countries. I will always support those who want to come to the USA on their own free will and play for USA, and will vote for the motion in that light. I’ll later vote no for any attempt to attract other players. Whether there's a "secret effort" as the New York Times asserts, remains to be seen. 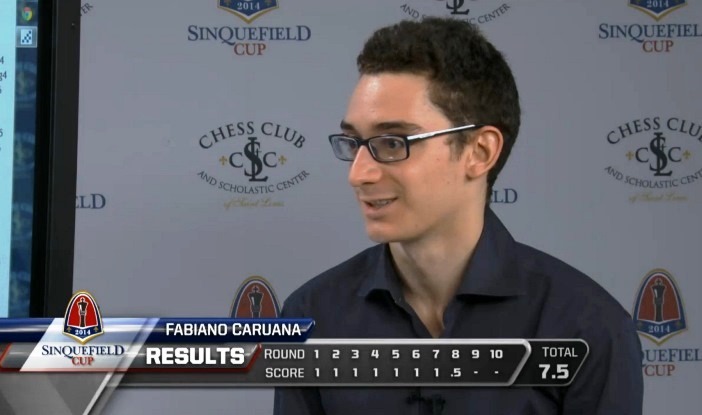 When we contacted Fabiano Caruana, he declined to comment, though he also referred to the Times story as "speculation". 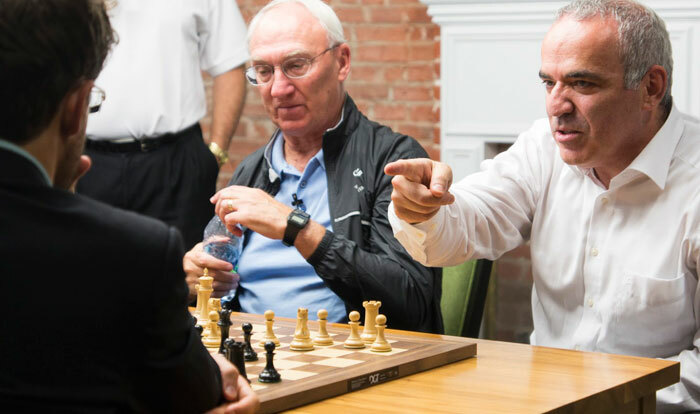 Over the next two weeks commentators Yasser Seirawan, Jennifer Shahade and Maurice Ashley will have 11 rounds in which to try and probe the players for more details about some of the stories mentioned in this article — though some chess may also get in the way! Macauley Peterson contributed reporting to this story. When are Carlsen and co. back in action?